Cue Miles Vorkosigan, malformed royal troublemakerвЂ”but also heir and savior of empire. On Kibou-daini, Miles unearths a war of generations as the oldsters in charge refuse to die and their descendants threaten outright patricide, matricide and maybe even genocideвЂ”the prize being a big fat slice of the immortality pie.В Bribery, corruption, conspiracy, kidnappingвЂ“something is rotten on Kibou-daini, and Miles is up to his neck in trouble and adventure once more. 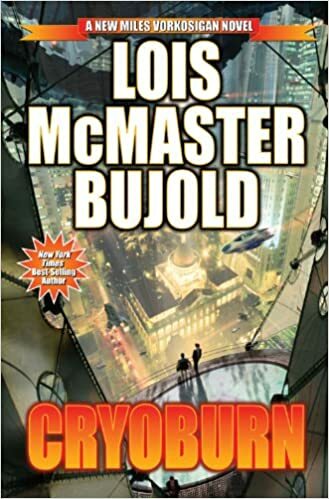 вЂњBujold mixes quirky humor with action [and] superb character developmentвЂ¦[E]normously satisfying.вЂќвЂ”Publishers Weekly. peered out. "You again!" she said. "I thought we were well rid of you." She squinted at Jin. "Of both of you." The eye traveled on to Raven. "Who the hell are you?" "Raven Durona, from Escobar," Raven answered readily. "Pleased to meet you." "He's a friend," Miles said. "As in, Pass, friend." He brandished the carafe. "May we come in?" "EhвЂ†.вЂ†.вЂ†." Reluctantly, but with her one open eye on the carafe, Suze gave way. She wore the same loose black garments as before; she probably slept in them.